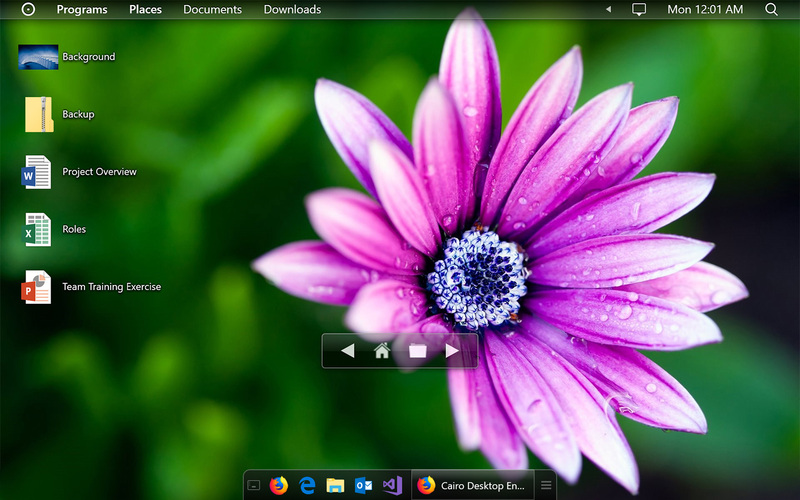 The Cairo taskbar preserves desktop area for your wallpaper and applications. In addition, windows are organized the same way you choose to organize your programs list, making it easy to switch between tasks. The list button shows your open windows in an organized, easy to understand layout. Never again waste time hunting for applications in poorly organized menus. Cairo lets you organize your apps into categories that make sense to you, using an easy drag-and-drop interface. With Cairo, your desktop is browse-able, meaning that you never need to open a file explorer to find your things. The handy pop-up navigation makes it easy to move forward or backward and completely transforms your desktop into a more friendly, convenient space. Tired of hunting for the same files over and over again, interrupting your work? With Cairo’s menu bar folder stacks, you can create instant access to frequently used folders. Simply drag them onto the menu bar to create easy access.